Fresh Okras (or Lady’s Fingers as these hairy and sticky vegetables are often called in Malaysia) plus shrimp and sambal equal to sambal okra. Wait a minute—I wish cooking Malaysian-style Lady’s Fingers were as easy as 1 + 1 = 2, but nothing prepared fresh is ever that simple (if it was, you wouldn’t need food blogs like mine!). Granted this is not a super-hard dish to prepare at home, but you must ensure ALL the following ingredients are present in your kitchen. No cheating, or else everyone will leave your dinner party early. Sambal Okra (Sambal Lady’s Fingers) recipe - Granted this is not a super-hard dish to prepare at home, but you must ensure ALL the following ingredients are present in your kitchen. Heat the wok and add the cooking oil. Stir fry chopped garlic and add in shrimp. Add the lady's fingers (okra), blended chilies, toasted belacan, and salt. Stir fry for a few minutes until the okra becomes sticky and cooked. Toss in the sliced chili, dish out and serve hot. Voila! You now have Malaysian-style Lady's Fingers - a classic dish from Malaysia. Wow, this looks good! I love ladies fingers but it’s very expensive to order at Malaysian restaurants. I will try your recipe. This is the kind of dish I like. Very simple. Thanks for sharing! i just cooked this dish for the very first time today. yours doesn’t look that sticky though. any advice to reduce the stickiness a bit? I LOOVVEE Ladies Fingers, especially in an omelette. Yum! my friend’s maid (from indonesia) cooks this dish almost the same way as you, but instead of ‘hae bee’, she uses fried ikan bilis… very sedap as well!! Ok, I came in here a wee bit too late. lol. What I do is I pound the Heh-bee with the pestle and mortar and smash it to tiny bits and pieces. By doing so, you are letting out the juices of the heh-bee. Once done, you put the sambal belacan and mix it together with the heh-bee. Thank you for sharing this wonderful recipe! Cooked it this afternoon, but used ikan bilis instead of the dried shrimp. Came out beautiful!!! Thanks for the recipe. I love Okra and at times am at loss of what else to do besides dipping them in hot broth for hot pot or stew them in Indian curry. Thanks for sharing this recipe. :) tried it today, and love it very much. Now I know the secret of good Okra recipe. dried shrimp! 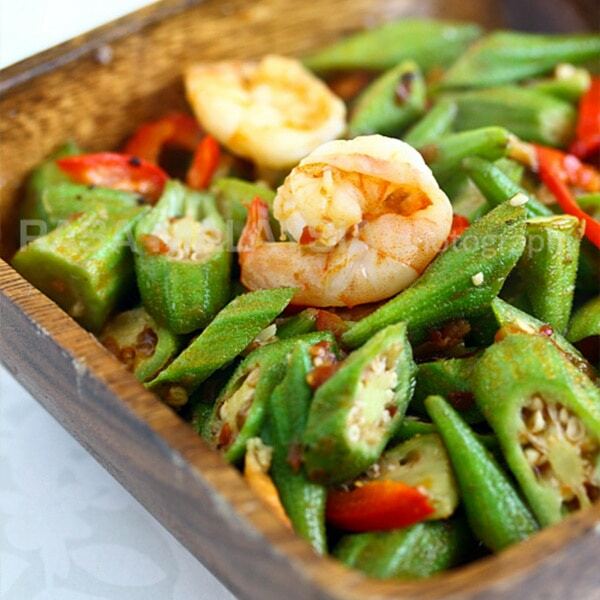 thank you for sharing the malaysian okras recipe. Your recipes are good but it seems you have used Shrimp in most of your vegetable recipes . In Bangladesh , we also use medium size shrimps or very small shrimps in Vegetable stir fry or veg.curry . It is also very good taste . As you may know that Shrimp has itself a very good taste . Whatever you add with Shrimp it will teste good. It is proved . But, sometimes eating too much Shrimps are not good for heart specially after 35 age . Also, adding Shrimps with vegetables sometimes expensive also . So, I wish if you can provide some Vegetable recipes or Chinese vegetables recipes without using Shrimps. You can skip the shrimp and make the dish completely vegetarian. Came across your recipe page while looking for sambal okra recipe. My husband and I cooked it a couple of nights ago and it turned out really good. So just wanted to comment and say thank you for sharing this recipe online! Look forward to visiting your site again soon. I pound the belachan, dried shrimp, shallots, garlic and chilli, quick stir in oil, throw in the okra and stir fry for 1-2 minutes, then pour in tamarind juice and a little sugar. Excellent! Sweet, sour and spicy! Will love to try with ikan billis. I cooked this the same way and with the same ingredients, recipe from a Malaysian cook book my husband brought to Canada 24 years ago. Your recipes are always great. In this recipe, you mentioned red chilies (Blend them)… what do you mean ‘blend them’ and how? Blend them with food processor. I have been following your blog for a while. Your recipes are great :). I love Lady Fingers Belacan. There’s a Malaysian restaurant near me and I order it whenever this dish whenever I go there. This is a very simple dish to make; however, I am not able to find the Belacan (Malaysian Shrimp Paste). I was born in the Philippines but came to San Francisco when I was 6. There is shrimp paste that we use but it is slightly different from the Malaysian Shrimp Paste. Do you have any idea where I can locate this Malaysian Shrimp Paste and what brand should I be looking for? Again, I would think that it would be easy to find it here in SF (we have such a diverse community). But I have gone to two huge Asian markets and have had no luck. Please help :). Thank you! You can find Malaysian belacan or shrimp paste at 99 Ranch. You have to look carefully it’s a block and wrapped in paper.